Having a preference for non-motorized watercraft, I was a bit skeptical when my husband’s family booked us on a 3-hour tour with Stagnaro Charter Boats out of Santa Cruz, CA but, I was pleasantly surprised by how much I enjoyed the experience and at how much time we actually spent watching animated humpback whales, and even sighted a blue whale. 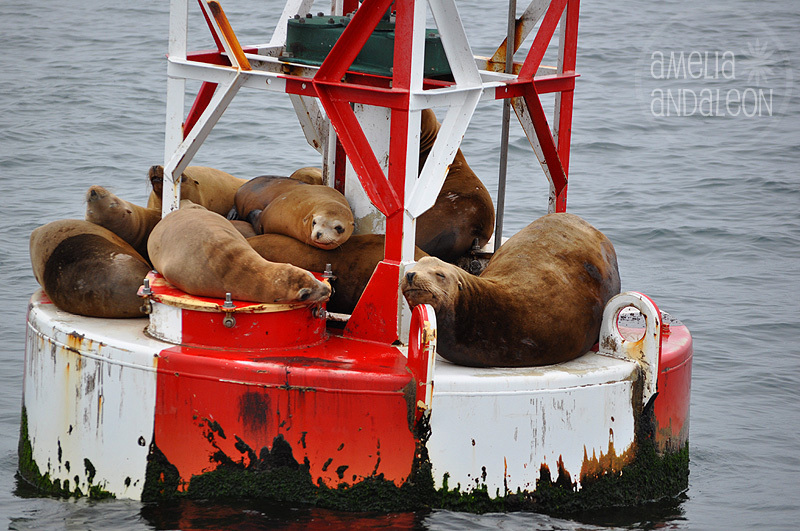 We began our tour watching playful bottlenose dolphins, California sea lions and otters. 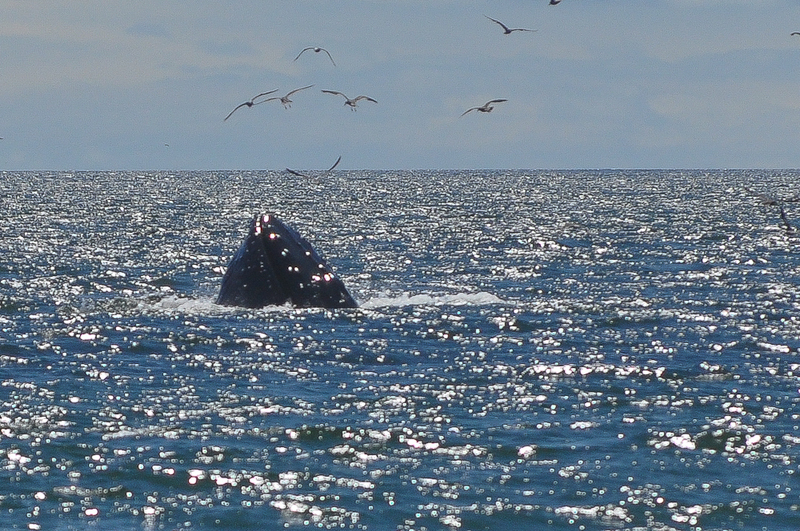 Then, after a long jaunt towards the open ocean we sighted our first humpback whales. 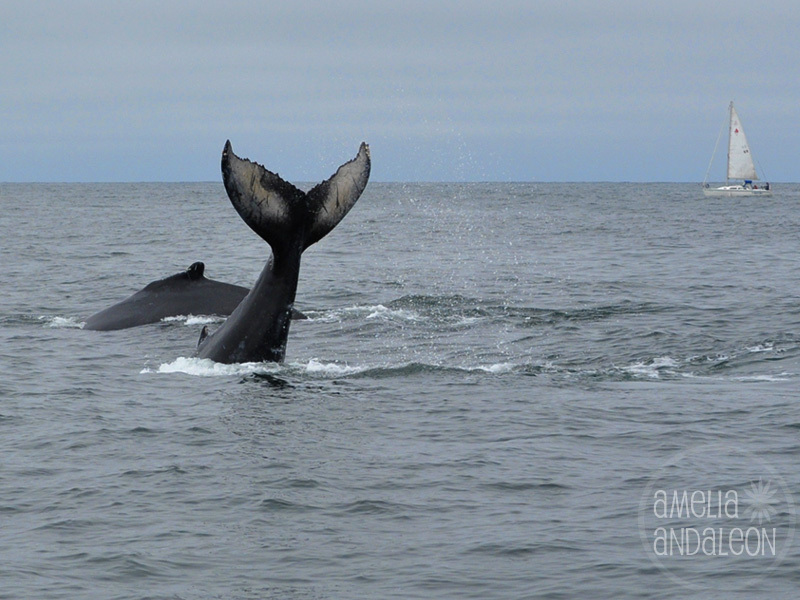 Fortunately for us, it was a mama and its calf, and the calf gave us quite a show. 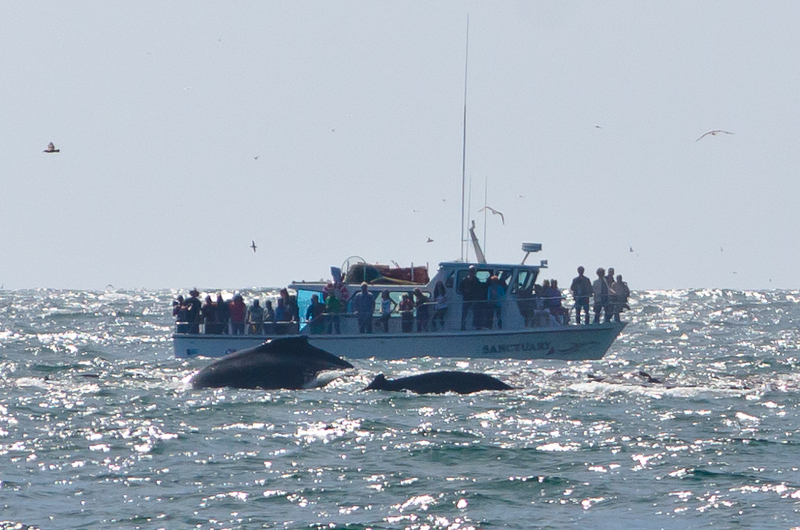 And, although I would recommend Stagnaro Charter Boats again if you’re considering a whale watching tour, their naturalist did inform us that the sightings are of course not guaranteed. Also, the trip was not without discomfort for some. In our group of 5, I was the only one that experienced no seasickness. Only our niece (9 years old) got sick 5 times 😦 and the rest were just mildly woozy. My daughter Nora (4 years old) didn’t get sick but, she claimed to feel and act seasick after her cousin got sick. I told her she was part mermaid and mermaids don’t get seasick. Low and behold…seasickness disappeared! But, the 3-hour tour did make her sleepy. Further into the trip, it got colder, and windier making for a miserable, uncomfortable ride. 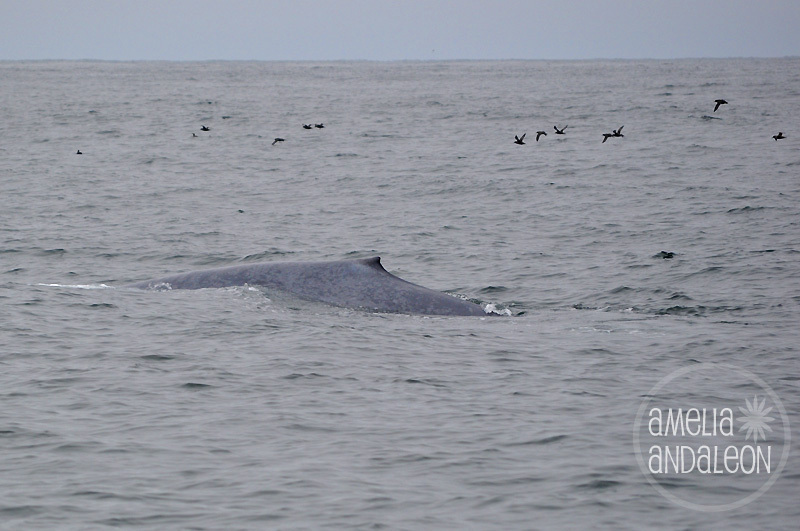 Being a Pacific Northwesterner, and a wildlife lover, I was so into the whales that I barely noticed the wet and cold. I think most passengers found the trip thorougly worth it. Only a few (who were still green when they stepped off the boat) swore they’d never venture on another whale watching tour. 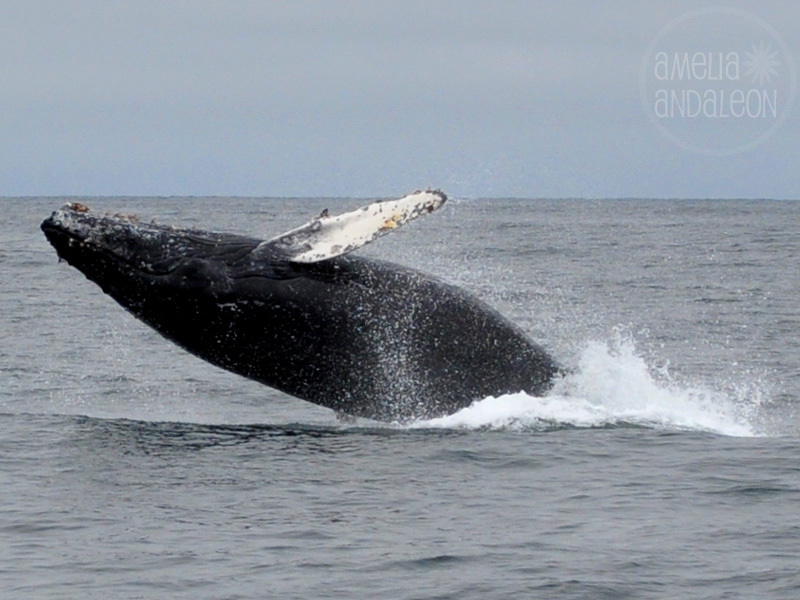 It’s hard to feel thrilled by a breaching whale when you’re nauseas or retching.